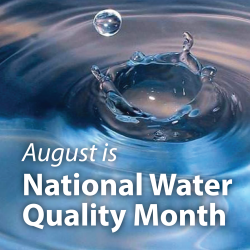 If you use automatic water-sampling equipment, consider performing a maintenance check-up during the month of August, which is National Water Quality Month in the U.S. 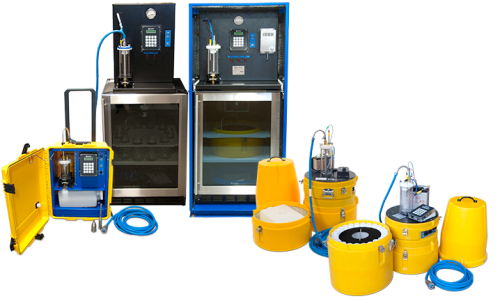 When you perform a maintenance check-up, you can help ensure that your equipment is operating at an optimal level and that you are acquiring accurate water-quality data. After collecting the samples and emptying the sample containers, thoroughly clean the sample containers. Routinely check that all of the tubing is free from cracks or splits. Replace any parts that are worn. Replace the tubing if algae or bacterial growth is suspected. Clean the metering chamber and conductivity rod routinely. To enable continuous sampling, remove the filled sample containers, and replace them with sanitized, empty sample containers. In addition to performing a general maintenance check-up of your water-sampling equipment, it’s always a good idea to make sure the internal backup battery of the water-sampler controller is working correctly. How long the controller’s internal backup battery lasts depends on how long it remains in disuse, how long it is in use, and the complexity of the running program. 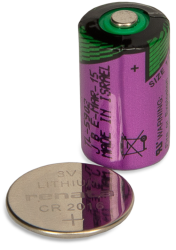 a 3.6 Vdc 1/2 AA size cell battery (pn 13519). For the internal battery, Campbell Scientific water samplers commonly use either a 3.0 Vdc coin-cell battery (pn 15598) or a 3.6 Vdc 1/2 AA size cell battery (pn 13519). Typically, your internal battery should provide several years of continued service. For example, under normal operating conditions and temperatures, the 15598 coin-cell battery (used in the PVS5120C and PVS5120D water samplers) has an estimated five-year life expectancy. The charge is down considerably (for example, down to 2.9 Vdc for a 3.6 Vdc battery). The sampler clock has drifted outside of the specifications. You notice that your entered programs are not being stored in memory. Either plug the sampler into an ac power source, or ensure that it has a fully charged external battery. Make sure the sampler is turned on. Remove the old internal battery. Insert the new internal battery. To replace the 3.6 Vdc 1/2 AA size cell battery, you will need to remove the four screws in the cover of the controller. Carefully lift the lid back so that the connecting cable does not become torn. With the lid in the lifted position, the battery is visible and easily accessible for replacement. To replace the 3.0 Vdc coin-cell battery (pn 15598), refer to the instruction manual of the PVS5120-series water sampler. Alternatively, call Campbell Scientific for assistance. Recommended for You: For more detailed maintenance information, including information about replacing an internal battery, refer to your automatic water sampler’s instruction manual. Thank you for doing your part—whether in August or some other time of the year—to monitor the quality of our water resources and help minimize the negative impact of neglect, pollution, and overuse. If you haven't heard about our newest portable samplers (the PVS5120-series), ask our experts about them. These samplers use a vacuum sampler controller (the VSC100) for enhanced flexibility to allow a Modbus RTU master, SDI-12 master device, simple pulse input, or Campbell Scientific PakBus data logger to control and communicate with the water sampler. We retired our line of automatic water samplers on December 31, 2018.